SB840 Cuatrocienagas. Tiny blue-grey stems. Hooked coloured spines. Frost hardy to temperatures as low as -12° C.
Origin and Habitat: Widespread and relatively common over a large area ranging from South-western US (Texas, New Mexico), to Mexico (Chihuahua, Coahuila, Durango, Nuevo León, Sonora, Zacatecas). 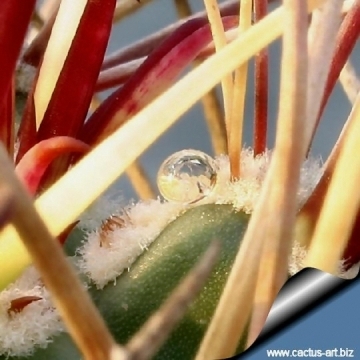 Habitat: Chihuahuan desert scrub, semi-desert grasslands, limestone outcrops, sometimes igneous 500-2000 m often growing within tuft of grass, this suggest that grasses are the most important nurse plants for this cactus.. 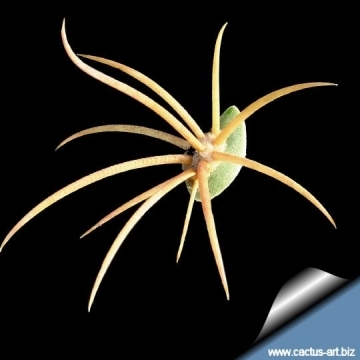 Description: Medium sized solitary cactus with very long central hooked spines . Stem: Globose or short columnar glaucous green or greysh green in colour, up to 15 cm tall, and not more than 8 cm in diameter. 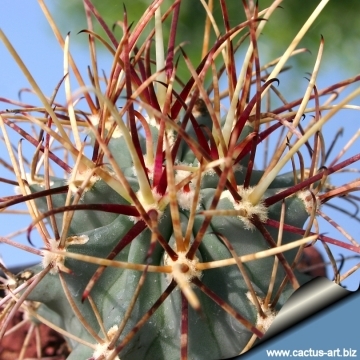 Spines: New spines in young areoles are pink to reddish, later straw coloured to pale gray. Radial spines: 8-10 , abaxial 3 hooked , nearly as thick as central spines 15-45 mm long. 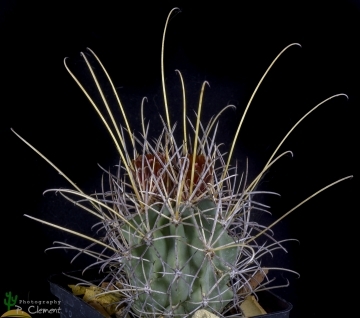 Central spines: Hooked, 5-12 cm long. Flowers: Relatively small, Approx. 2-4 cm. long, 2-3 cm in diameter. 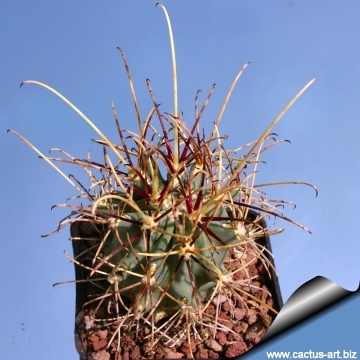 Very distinctive brick-red to purplish or brownish purple, usually dark or dull. 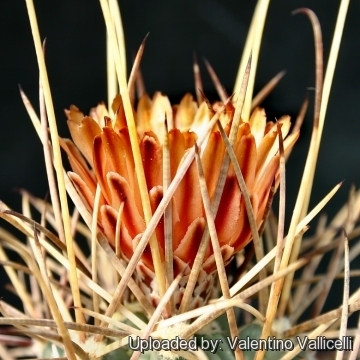 (Much the colour of Mammillaria pottsii flowers). Several flowers usually develop together at the stem apex. Blooming season: Spring (March-May), the flowers remain open for up to twelve days. Fruits: Roundish, bright red, with numerose conspicuous white fringed scales, pulp mealy. Fruiting May-June. it is common to see several fruit developing simultaneously at the stem apex. 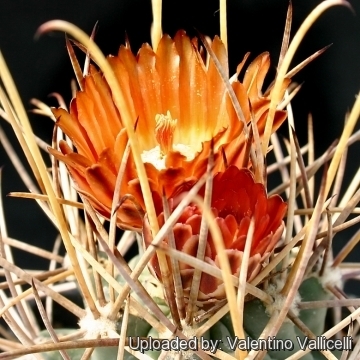 Remarks: The northern species Glandulicactus uncinatus var. 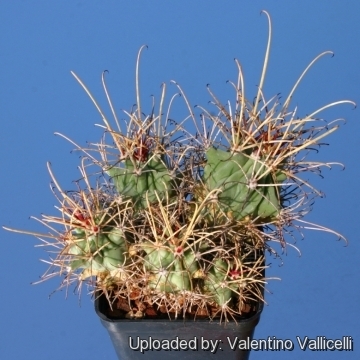 wrightii has characteristic red fruits while the similiar and often confused Glandulicactus uncinatus var. uncinatus has green fruits and is endemic in and around San Luis Potosí, Mexico south of var. 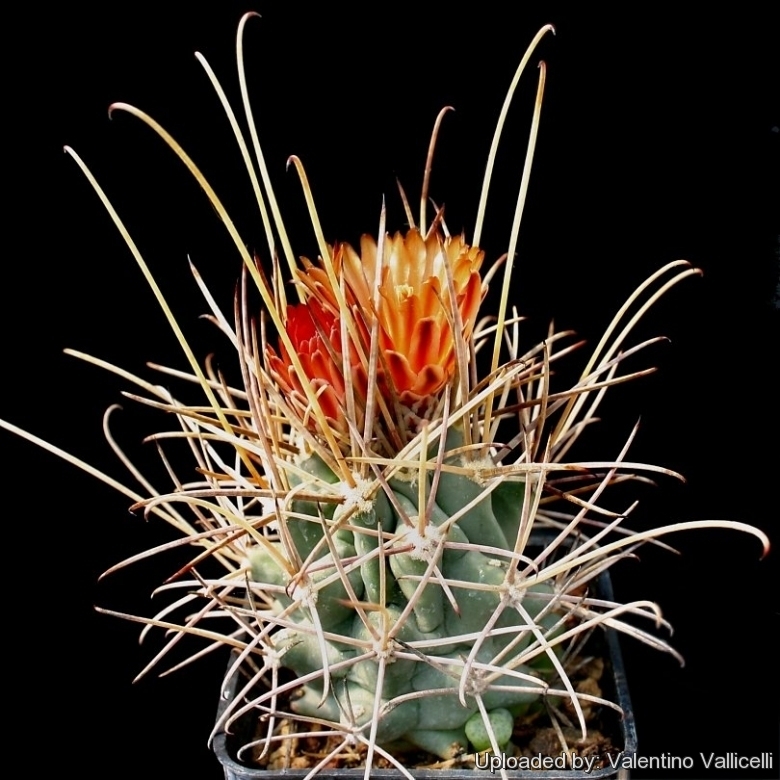 wrightii; perhaps it is more similar to Glandulicactus mathssonii from even farther south (Guanajuato).